Religious Culture in Utah – North American Baptists, Inc.
You have been praying…and we know that! This fall we have experienced many great opportunities to reach out to international students and immigrants. We launched our Conversation Cafe in September with two sessions per week on campus and at CenterPoint Church. 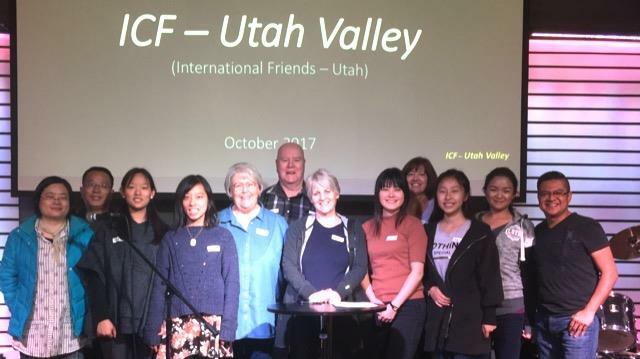 We also began an International Christian Fellowship (ICF) in October. The Lord has blessed us by placing nearly 20 international believers in our ministry here in Utah County. They come from more than 10 nations and most are from the 10-40 Window. These internationals need the fellowship of other true believers to encourage them in their walk with Jesus and also give them an opportunity to reach out to their friends. Let me briefly explain what an ICF is: it is both a gathering celebration for Christian internationals and a great opportunity to invite friends to hear the truth of Jesus. We meet the first Saturday of each month at CenterPoint Church from 6:30-8:30pm. The evening consists of: 1) a potluck supper 2) a mixer/group game (led by a student) 3) a worship time of singing (led by students) 4) a student sharing their story of coming to faith in Jesus Christ 5) dessert and fellowship time. Nothing is a more powerful witness to non-Christians than meeting true Christians who love Jesus and love each other! Our students are now organizing and planning these events. We had 12 attend in October and 15 in November. We live in a very unique religious culture here in Utah, and many of our students have been harassed and pressured to join that religion. For example, two young women had their rent raised on them because they refused to meet with the LDS missionaries that their host family had scheduled. This fall, I led 2 training seminars with over 20 in attendance in Chicago & Detroit. Pray that those who attended will begin the joyful journey of reaching internationals. Your fellow brothers and sisters here in Utah need your prayers! Pray for the breakdown of strongholds and victory over the darkness in this place. It is truly a mission field!